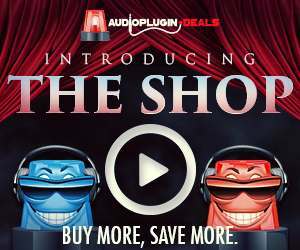 Erica Synths is presenting some of their exciting new products at Superbooth 2018, and we are there to get the news and bring it home. There’s quite a bit of stuff, so let’s begin (and stay tuned for our videos)! Erica Synths Techno System is a set of 15 modules put together as one of the most advanced techno/industrial music performance instruments. 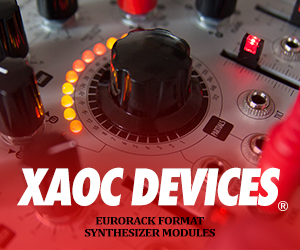 It contains set of new analogue drum modules, advanced drum/loop sampler, fat sounding fully analogue synth voice designed for screaming acid basslines. bite to the overall mix. Every module has CV control over most important parameters for true modular functionality and dynamics of performance. UPDATE: modules now available separately! 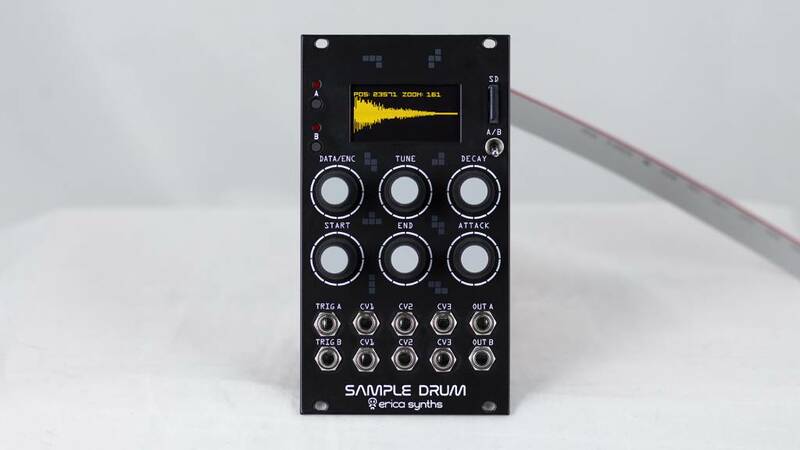 Performance oriented Erica Synths Sample Drum brings you two independent drum sounds or loops with plenty of manual and CV controlled parameters. Samples are stored on the microSD card, and OLED screen makes working with samples instant and easy. 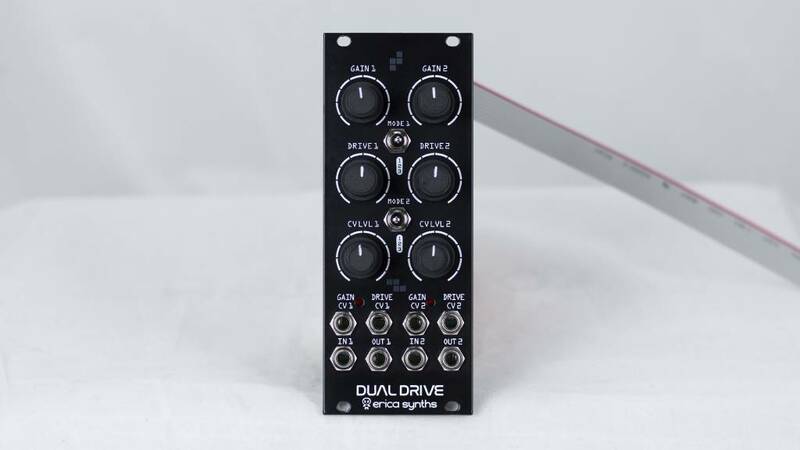 For extreme, distorted drums Dual Drive module is a must! It features two identical sections with adjustable Gain and Overdrive, each with three flavours of overdrive. CV control over Gain and Drive add more expression to drum sounds. The module can be used in the stereo applications, as well, or as cascaded dual drive. 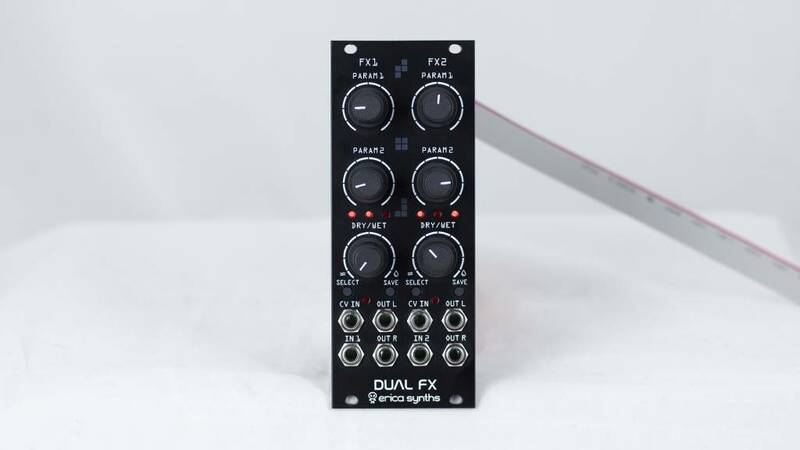 Dual FX comes with 2×8 custom effects, developed by Erica Synths teamrider KODEK in collaboration with Gary Worsham. It has analogue Dry/Wet crossfade, 2 parameters per effect and assignable CV input. Useful feature for live performances – all parameter settings can be saved with the effect and recalled instantly with selecting the effect next time. 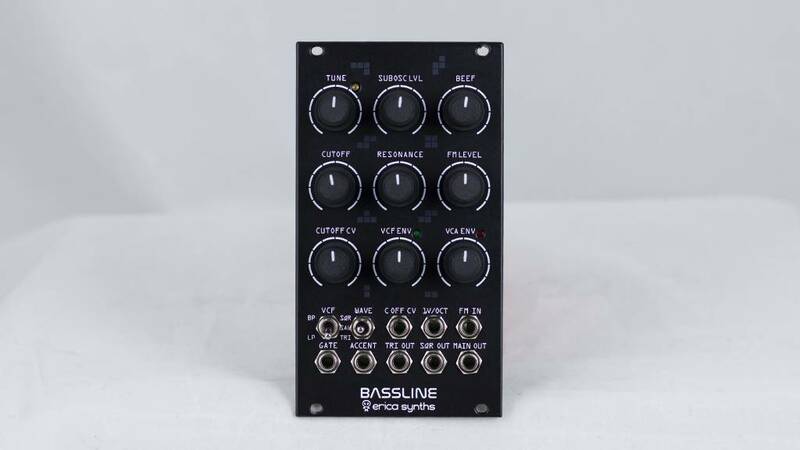 This is full analogue synth voice module for ultimate acid basslines. It features AS3340 VCO with three waveforms, a filter inspired by Erica Synths Acidbox and unique features – transistor-based suboscillator and two BBDs that emulate VCO detune. 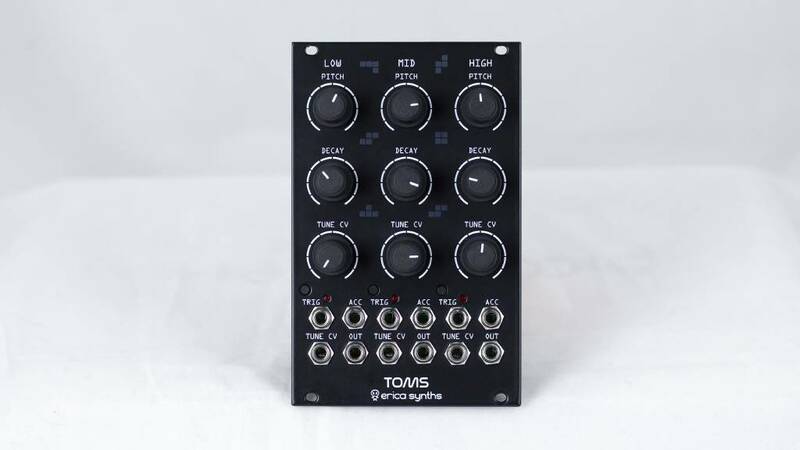 909-inspired TOMS take classical drum machine sounds to the next level with a modular functionality by adding CV control and expanded sonic range. The module contains Low Tom, Mid Tom and High Tom, each with individual controls and accents. 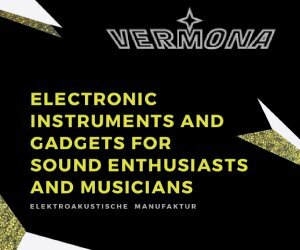 The module is developed in collaboration with e-licktronic. 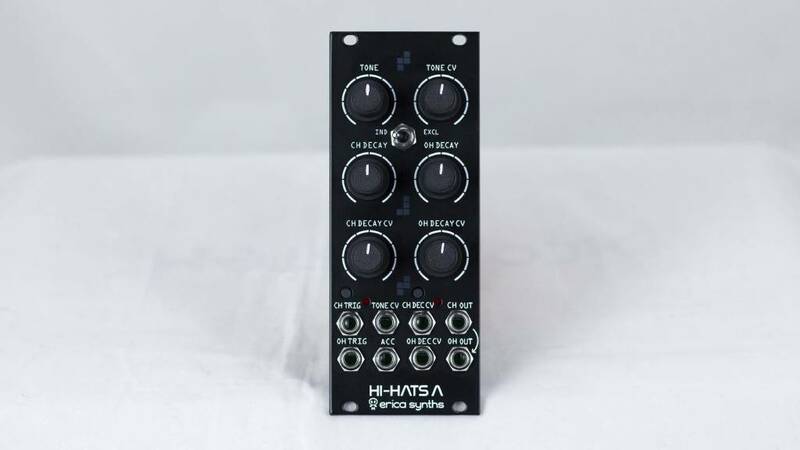 Full analogue Hi-Hats module with accent and manual and CV control over Tone and Decay (individual for each hi-hat) allows you to create lot of variations in hi-hats track. Closed hat and Open hat can be played independently or exclusively. The module is developed in collaboration with e-licktronic. These are sample-based hi-hats with analogue VCA and decay envelope. This exceptionally well integrates hi-hat sound in analogue drum modules mix. These are sample-based Cymbals with analogue VCA and decay envelope. The module contains 10 sets of cymbal sound samples. Ride Cymbal and Crush Cymbal have manual and CV decay control. 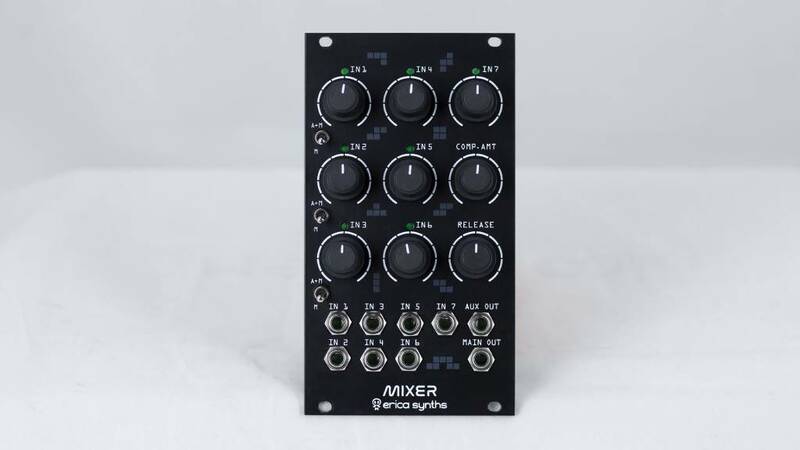 Compact, 7 input Drum Mixer of unique design provides greater dynamic range and built in vactrol-based compressor for high clarity of each drum sound in the mix. The mixer has Main output and Aux Send output. The first three inputs have selectable allocation – to the Main output or Main output + Aux Send. compressor settings can be adjusted to a taste via trimpots through the front panel. 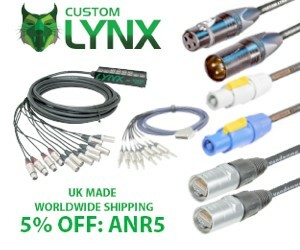 The mixer has Main output and Aux Send output and the first three inputs have selectable allocation – to the Main output or Main output + Aux Send. 4 channel stereo mixer with a limiter completes your modular drums mix. Input 1 can be used as mono input with manual L/R panning, while Input 2 can be merged for two independent mono inputs, as well as boosted for +6dB.